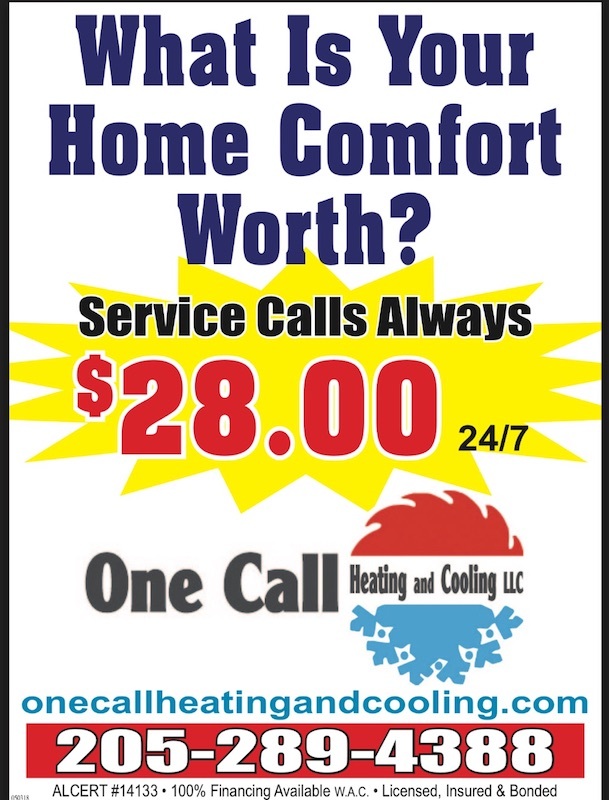 One Call Heating And Cooling, LLC ensures that you’ll be comfortable all year round by providing the area’s premier heating and air conditioning services that will handle all of your residential and light commercial needs. We have, combined, over 80 years of experience in the industry that ensures we give you and your HVAC systems the knowledgeable expertise and quality solutions the project deserves! Serving Birmingham, Tuscaloosa and all of Central Alabama, we specialize in air conditioning services, heating services, HVAC installations, HVAC repairs, maintenance, and much more. Our focus is on providing superior customer service, friendly interactions with customers, and service that is founded upon integrity throughout the entirety of the job. It is our goal to give you the high quality workmanship and honest service you can count on, at an affordable price your budget will always agree with. Call One Call Heating And Cooling, LLC in Warrior, AL today at (205) 289-4388 for the air conditioning and heating service that will always exceed your expectations. Take control over your interior climate comfort with just one call to our experts.